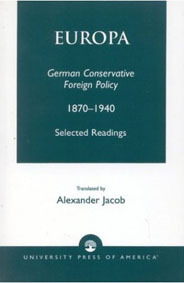 Translated with an introduction and notes by Alexancer Jacob. Covers four leading right-wing German thinkers of this period: Paul de Lagarde, Constantin Franz, Edgar Julius Jung and Alfred Rosenberg, They had interesting views on ethnic and religious issues and developed the idea of a federalistic Germanic Reich. P/B, 157pp.